A katar (devanaagarii: कटार = kataar), also known as a bundi dagger, is a type of short punching sword that is native to the Indian Subcontinent and popular elsewhere for swift and quick attacks. It is notable for its horizontal hand grip, which results in the blade of the sword sitting above the user's knuckles. Typically, katars were used in close range hand-to-hand combat, which is effective in armour piercing. 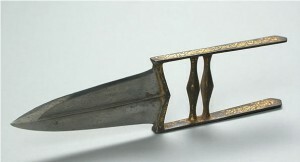 The blade was often folded or corrugated for additional strength. Some knives have a mechanism responsible for making the blades split. This happens when the user pulls the hand grips together. 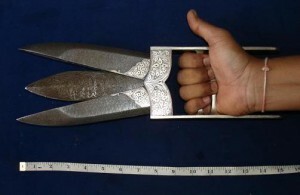 In this variety of katar, two hand grips are used, so that the mechanism can be activated. This feature was often used to inflict a greater damage to the enemy, having the blades splitting inside of them and slashing their insides. "Hooded katars" are katars with a shield extending over the back of the user's hand. Katars ceased to be in common use in the 19th century. The katar is the oldest and most characteristic of the Indian knife weapons. The peculiarity lies in the handle which is made up of two parallel bars connected by two, or more, cross pieces, one of which is at the end of the side bars and is fastened to the blade. The remainder forms the handle which is at right angle to the blade. The blades are always double-edged and are generally straight and with lengths from a few inches to about 3 feet. 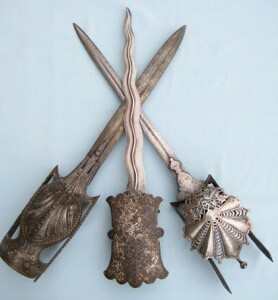 The blades of southern India are often made broad at the hilt and taper in straight lines to the point, and elaborately ribbed by grooves parallel to the edges. European blades of the 16th and 17th centuries were often used, especially by the Mahrattas and were always riveted to projections from the hilt. Katars with native blades are often thickened at the point to strengthen them for use against mail and are often forged in one piece with the hilt. The blades are sometimes forked at the point, and katars with two, and even three blades occur. The Indian armorers occasionally made katars that were hollow and served as a sheath for smaller ones: or with three blades that folded together, appearing to be one, until the handle bars were pressed together, when they opened out. 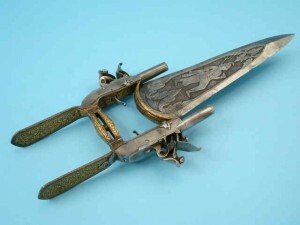 There is even a katar displayed at the City Palace Museum in Jaipur, with two single-shot pistols built into either side of the weapon. This is an innovative design, as it enables the user to immobilise at least two opponents even before having to use the blade. Many katars have guards for the back of the hand made with solid plates but many are elaborately pierced. Among the Mahrattas the gauntlet sword, called pata, was evolved from the katar. The katar is a purely Hindu weapon and is never found outside of India. The katar is unique because to stab an opponent one has to punch instead of thrust, unlike when using a regular knife or dagger. This leads to much more acrobatic fighting styles. It is more like an extension of the fist than a dagger, and it seems more natural to attack and defend with a katar. Sometimes, a katar is also used as a main-gauche in dual blade fencing. When a katar with multiple blades is used, it is rather easy to catch any more traditional weapon (sword, staff) between them and get a hold. Katar wielder has an advantage in a narrow passage. A longer bladed weapon similar to a katar is the pata. A similar style western weapon is the push dagger. Multibladed katar is sometimes called suwayah. Katar is also a basic term for any short bladed weapon with the same handle as the one in the picture above, although stabbing is its primary purpose, many blunt ended Katars have been made, some with no tip at all.